This activity purpose to develop the Manner of Thai. Focus on 4 skills of Using Thai language and learn Thai Culture. 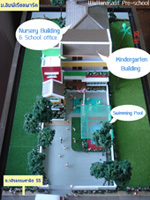 Wattanasatit Pre-school sukumvit 101/1: English Program , We are intelligence and academic program. We suggestion the Intensive Thai Short Course on summer. This program aim to exchange the experience of students. They will learn in exchange style in the school program. Conversation I focuses on daily life. Students begin their learning with useful vocabulary [numbers, food, telling time, parts of the body, family, and other topics of simple conversation]. Classroom activities are highly interactive, using props, objects, and pictures to stimulate conversation. Reading and Writing by alphabet focus on individual skill. The program prepare the basic of building the word and sentence. Course content includes learning about Thai culture. 09.00 a.m. - 11.00 a.m.
*limited 3-5 joining students per class. Promotion 2 Enroll 2 courses get 10% discount for second couse. for everyone who enroll course. Bussiness time : Mon - Fri 7.30 am. - 5.00 pm. Sat 9.00 am. - 3 pm.